Easy baking doesn't mean less delicious, it's mean you can be relax while baking. When I have a lot of egg whites in the fridge, financier is what I think about, it's easy, delicious and with a little touch of magic it can be beautiful too. 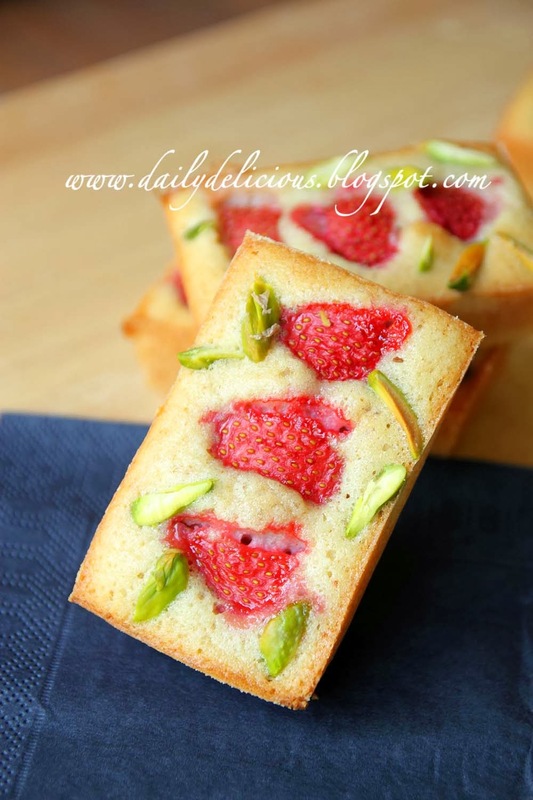 With a bit of red color from strawberry and green from pistachio this little cake become so lovely. 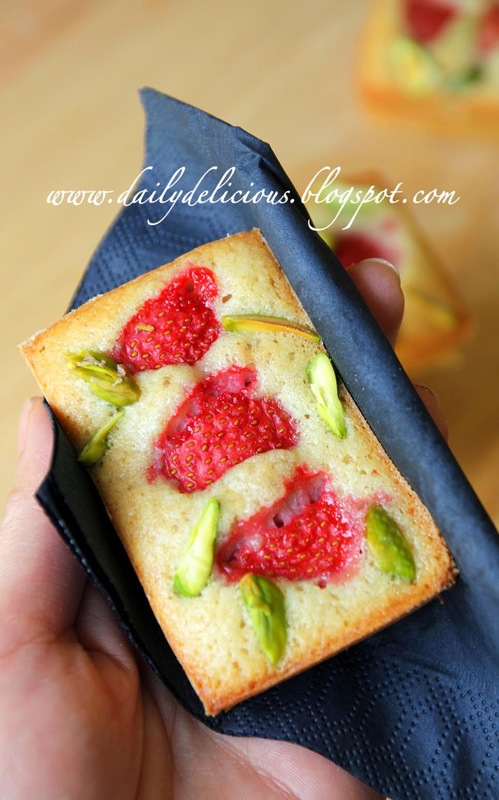 Both the strawberry and pistachio don't only add the beautiful color, they make the financier more delicious too. For this recipe, you just melt the butter until the milk segment separate from the butter, don't need to turn it into beurre noisette (burned butter), because the smell of the butter will be too much you need strawberry and pistachio to stand out too. For this kind of bake, preparing the moulds is very important, you need to butter the pan throughly and flour the moulds properly, or the cake will stick to the moulds like crazy, hehe. Serve it with a cup of hot tea, it's easy but great tea time treat. 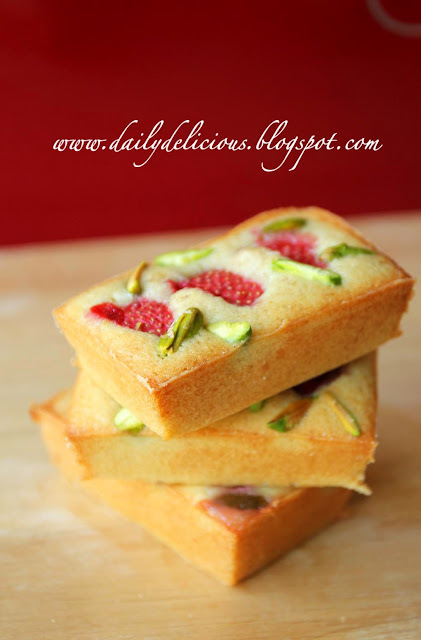 Butter and flour 6 small 10 cm rectangular moulds (or financier moulds). Put the icing sugar, flour and ground almond in a bowl and whisk to combine. Melt the butter in a sauce pan over low heat and pour into a separate bowl to cool it down. Whisk the egg white until it become liquid (don't let it become foamy), gently stir the egg white into into the flour mixture, then incorporate the cooled melted butter. 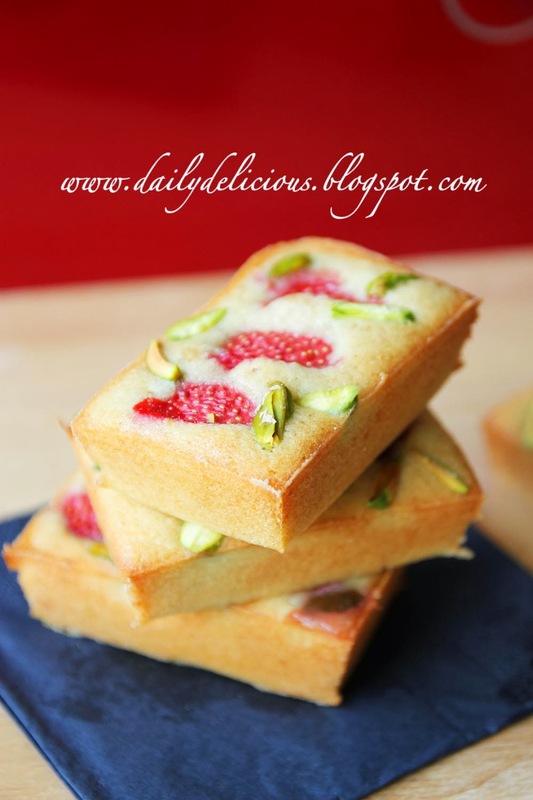 Pour the batter into the moulds, place strawberry pieces on top and sprinkle with pistachio. Bake for 20 minutes or until the cake is golden and the edges are beginning to turn brown. Let the financier rest in the moulds for 10 minutes before removing from the moulds. That one, the pistachio is grounded into the batter too, for this time, I want to make it easier, but both of them are delicious. May i know what is the size of your mold? Im getting them at ebay , i want to get the same size as yours. what does whisk egg white until liquid but not foamy mean? if i whisk the egg white it becomes foamy soon. or you mean whisk until frothy? pls help im making this soon. My mold is 9x6x4 cm ^^. And for the egg white, don't let it become foamy mean just stirring it until it become liquid, you don't need to whisk it.